Sigmund, Software Delay/Echo from D16 Group. laurent BERGMAN's review (This content has been automatically translated from French)" Excellent!" For specifications, refer to the "Info" I filled this purpose tab. Installation is easy via an executable, making the authorization as usual with the keyfile available for download from the user account on the site. Very stable on a Macpro 8 x 2.4 gHz Mac OSX 10.6.8/Logic Pro 9.1.8 and Mac OSX 10.8.5/Logic X 10.0.3, 8 ° G ram, Motu 896 HD. The only negative statement is a large consumption of CPU resources in certain combinations fairly extensive. After extensive use of plug-in for several months of beta testing, I must say I'm quite charmed by this new product. The interface is very successful, clear, intuitive, fun and very colorful which makes the visual less austere than other plug-ins of the company. This is a pretty particular product, some aspects are innovative. I had the opportunity to work with the PSP-608 in PSPaudioware or the Ohmboyz OhmForce from home, I can say that the result has nothing to do. The number of combinations of effects is quite impressive. The multi-mode filter is excellent and can be inserted into the feedback loop. The overdrive is also of good quality. Rare thing about this type of effect can be treated (left / right) stereo signal or decode / encode signals Centre / Sides (Mid / Side). You can come to bring or other syncopated groove through two LFO's that can affect the filter cutoff and / or amplitude (tremolo), note that the settings of the LFO 1 and LFO-2 are common to all four delay lines. A modulation effect (linear or logarithmic) can be added in the section's LFO, which allows you to go further in research. For automation, since the number of parameters exceeds the limit of 127 controllers (VST and Audio Unit-norm), the assignment of the parameters to be controlled by the automation is done via the assignment table settings located in the "Option" menu (as in the lush-101). It is also entitled to integrated "MIDI Learn" (note only the VST version) for the takeover by an external Midi controller, the assignment is a simple copy, click on the MIDI Learn button, turn just the desired setting, then you turn the knob to the desired Midi controller and the link is done automatically, and then click again on the MIDI Learn button. For users of version audio unit, the assignment of parameters to commands from an external controller must be done via the integrated window Learn Midi Logic (cmd key + L). 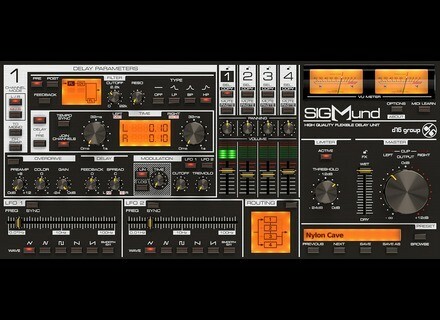 It is important to note that as Logic uses automation settings for their assignment to MIDI learn, you must first assign the parameters to be monitored in the "Parameters" tab found in the "Options" menu Sigmund without this manipulation we can not control the settings via an external controller. The function of copy / paste settings from one period to another is very convenient (Mac OSX: cmd key + click "Prev" to copy and cmd + click on "Next" to paste the settings) in order to keep the same time settings and slightly edit a delay relative to each other (that function is also found in the lush-101). It can also lock blocks settings with a single click, so that their values ​​remain fixed when changing presets with icons shaped padlock. The sound quality is at the rendezvous as usual D16, combinations of pre-defined routing can further expand the effects that can be achieved palette. You will understand, it'sa is an excellent tool for sound designers or for those who like off the beaten path. That said it can, of course, entirely appropriate in the more conventional uses or for effects other than delay. The factory presets can really get an idea of ​​the potential of this plugin.